Fluoride levels in 493 villages are exceptionally high. Fluorosis Se Jung aims to help residents protect themselves from its effects. In August, Palak Ramesh showed no hesitation when the teacher at her government school in Haryana’s Khedli Khurd village asked her to spell out her name. But the next moment, when the 13-year-old student was asked to demonstrate a few stretching exercises, her confidence ebbed. When Ramesh tries to touch her ankles or stretch her arms, her joints, back and shoulders ache. That pain seemed bearable. A more agonising wave of embarrassment swept over Ramesh and the quiet group of teenagers who had gathered around her when they smiled – they were conscious of their yellowing teeth. It’s not that they had ignored good dental-health practices. “Hum har din brush karte hai,” protested Ramesh’s friend Arseena Vakeel. We brush every day. They are among the thousands of people in the region who suffer from dental fluorosis, or mottling of teeth, one of the most common effects of drinking fluoride-contaminated water. In March, the fluoride level in the groundwater of their village was recorded as 14 mg/litre of water. A level of 1mg or less is considered normal. Fluoride is the second-most common pollutant of drinking water in India, said Tarit Roychowdhury, an associate professor at the School of Environmental Studies, Jadavpur University Click To Tweet. “Upon entering the body, the fluoride attacks calcium-enriched organs like teeth and bones – the former more than the latter,” he said. “This is why dental fluorosis is so common. Khedli Khurd is one of the 439 villages in Haryana’s Mewat district that has to deal with excessive flouride in its groundwater. Over the years, NGOs have attempted to make villagers aware of the problem and to install water filteration plants to help remedy it. In August, Alfaz-E-Mewat FM 107.8, a popular community radio station in Mewat, launched what is perhaps the most innovative effort to keep residents healthy. It kicked off a show titled Fluorosis Se Jung, or Battle with Fluorosis. This eight-episode series includes dramas and question and answer sessions with doctors. The station has also handed out 8,500 moringa, or drumstick, plants, a species that is believed to help to reduce the effects of fluorosis. According to a study published by the Journal of Industrial Pollution Control in 2007, moringa is an effective “defluoridating agent” Click To Tweet. It recommended that both Moringa pod as well as the leaves should be part of the diet of people living in fluorotic areas. The idea for the initiative struck Faakat Hussain, a radio jockey at Alfaz-E-Mewat who hosts a question and answer show Tere Mere Man Ki Baat in March, when he received an on-air call from a shepherd from Khedli Khurd. The caller’s 40-year-old wife was finding it increasingly difficult to carry out her daily chores. When she worked in the fields or collected grass from the nearby forest, both tasks involved a lot of walking, her knees hurt. During the course of that conversation, Hussain realised it was a problem faced by many women in Khedli Khurd. Shortly after, he visited the village with Dr Rizwan Khan, the district consultant appointed in Mewat under the National Programme for Prevention and Control of Fluorosis. They took a water sample from the village and Khan had it examined it in a laboratory at Al-Afiya General Hospital, Mewat. The water was found unfit for consumption. (Left to right) Pritam Singh, a teacher at the government middle school in Khedli Khurd, Faakat Hussain, a radio jockey at Alfaz-E-Mewat and Sohrab Khan, a teacher at the school. Since there was no awareness about fluorosis in the village, Hussain and his team decided to use the radio – the most common medium of entertainment and information in the district – to talk about the medical condition. The 20-minute sessions, hosted by Hussain, with Khan and Sanjeet Panesar, assistant professor in the Department of Medicine at Shaheed Hasan Khan Mewati Government Medical College, are brodcast every Tuesday at 10.50 am. The show is repeated at 9.35 pm the same day. a man talking to his friends about how his wife struggles with swollen, aching joints. 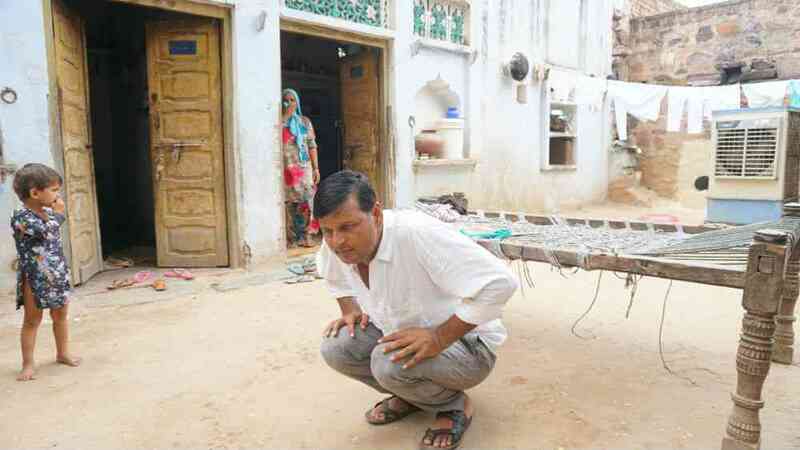 His friends advise him to head to the Alfaz-E-Mewat station and pick up some moringa plants to help his wife. The plays and songs are aired twice or thrice every day. 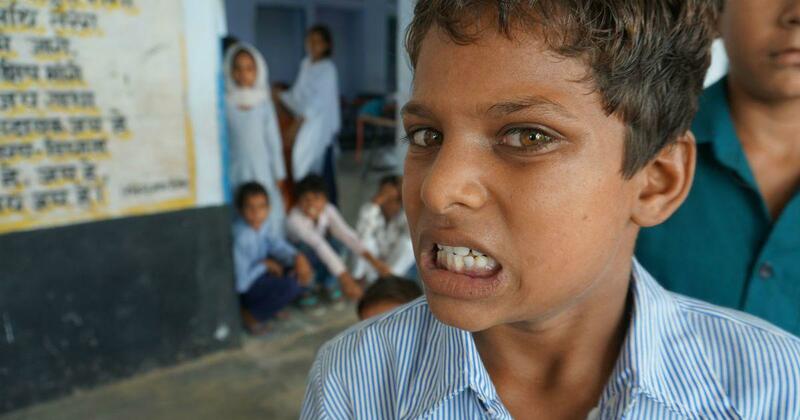 “A lot of them still don’t know what fluorosis is, so we try to communicate in ways they understand,” said Hussain. For them, their knees and ankles swelling translates to ‘ghutno mei hawa bharna’ or air getting filled in their joints. So we tell them the plant [moringa] is a good cure for that [problem] and eventually explain fluorosis to them. Alfaz-E-Mewat was established in 2012 by the Sehgal Foundation, a charitable trust that is conducting research on flourosis. Lalit Mohan Sharma of the foundation says that the spread of the disease has its origins in region’s depleting groundwater levels. As residents dig borewells that are ever deeper, they are reaching water contaminated by fluoride-rich rocks. The deeper the borewell, the greater the fluoride levels in the groundwater. Photo credit: ABHIJEET / Wikimedia Commons [CC Creative Commons Attribution-Share Alike 3.0 Unported]. On August 7, Alfaz-E-Mewat invited several villagers, including children, to the community radio’s centre at Ghaghas village for a session conducted by Sharma, Khan and Panesar. They explained to the villagers that swollen joints were more than just a case of “hawa bharna” or air getting filled in their joints. Within two weeks after the session, Hussain says, the first batch of moringa plants was almost over. Mewat was added to the list of endemic regions by the National Programme for Prevention and Control of Fluorosis in 2011-’12. But, according to Khan, the government is yet to supply alternative sources of drinking water or reverse osmosis facilitators to most villages. As a result, villages like Khedli Khurd continue to depend on groundwater sucked out through borewells. “Should we die thirsty instead?” asked 53-year-old Faizan, a resident of Khedli Khurd. Her son Jafruddin, 35, was diagnosed earlier this year with avascular necrosis, a condition in which the blood supply to the bones is obstructed. 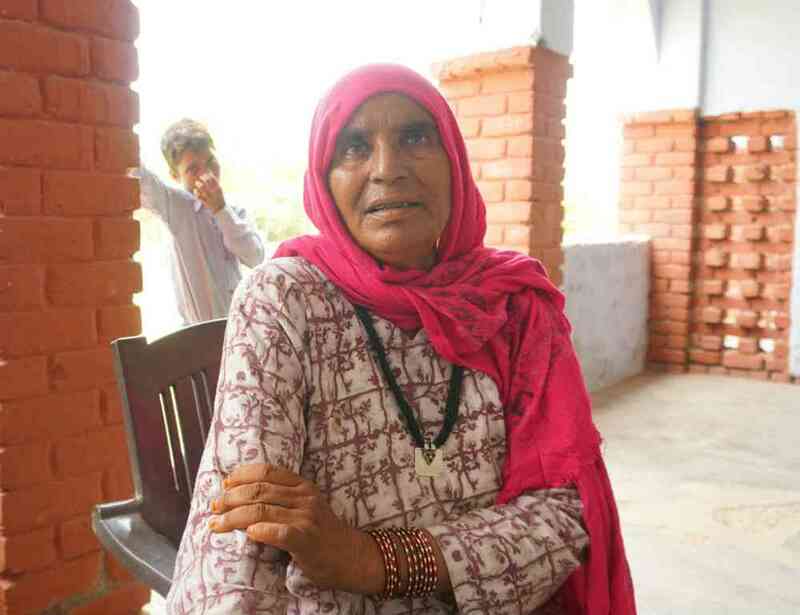 “I was in Gujarat for about 10 days after my doctor asked me to move out of Mewat for a while,” said Jafruddin. “I felt considerably better there, even without taking medicines. Now that I have come back, I will have to depend on the medicines again to move around.” When Jafruddin tried to squat on the floor, his teeth clenched in pain. Sohrab Khan, who has been teaching at the government school for the past six years, feels he is losing his agility, even though he does not stay in the village. “I can sense stiffness in my joints,” he said. “Since I am here for most part of the day, I end up drinking the water at the school.” Sohrab Khan is among those who took a moringa plant from Alfaz-E-Mewat, hoping it would stave off the symptoms of ageing he is facing in his 30s.